It has been far too long since I last posted an article here on this site. It has not been an easy year for me so far (read here to find out why). But now I am back and keen to post many more bird photos here, as well as relate some highlights of my travels and birding experiences. Last week my family celebrated my grandson’s 10th birthday, so I just had to come over from South Australia to Sydney for the occasion. It’s a 14 hour, two-day drive so it is not a trivial undertaking. This was my first big trip by myself, so I decided to take three days and take it easy. I am pleased that I did because I saw a few birding highlights along the way. More of that in coming posts. The birthday party was held in a park near my son’s home and it was very successful – despite the rain trying to spoil it. The invited guests were determined to have a good time, and they did not to let the rain spoil their fun. It was a huge success and the food was also great. Love party food. When I left home in Murray Bridge last week, my first stop was at Lake Roberts on the edge of Lameroo, a small farming based community in the eastern part of South Australia. I stopped for a break and a cup of tea. As I was having my morning tea, I made a list of the birds seen and heard. I also grabbed my camera and took a few photos. The photo above is a general shot of the artificial lake. Behind me is a small caravan park and to my left is a picnic area with tables seats covered by a roof. My bird list for the twenty-minute stay is not long, nor is it exciting – except for one bird. It is the last species which grabbed my attention. I have visited this spot on many occasions on my trips to and from Sydney. 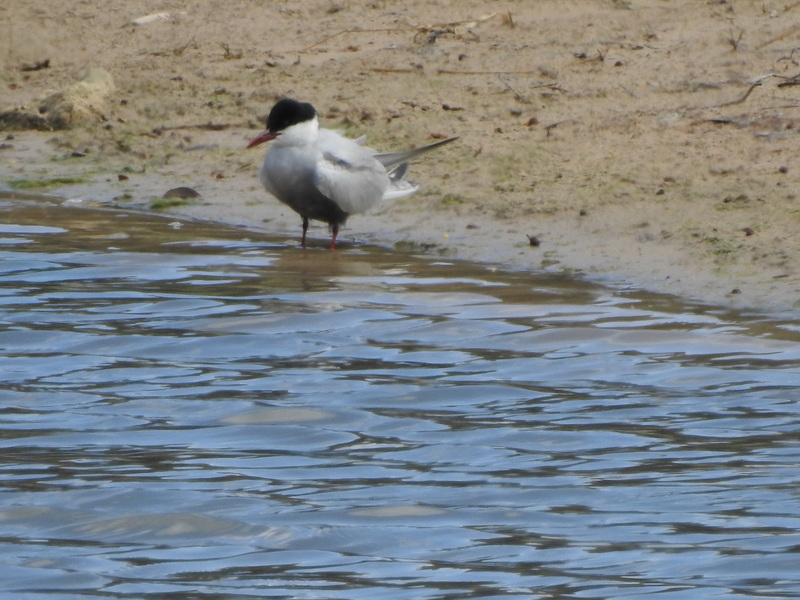 This is the first time I have recorded a Whiskered Tern in this spot, and although it is a widespread species throughout much of Australia, it was an unexpected extra on this occasion. The photos are not great, unfortunately. Many of the photos were taken at extreme zoom, and are therefore not great. 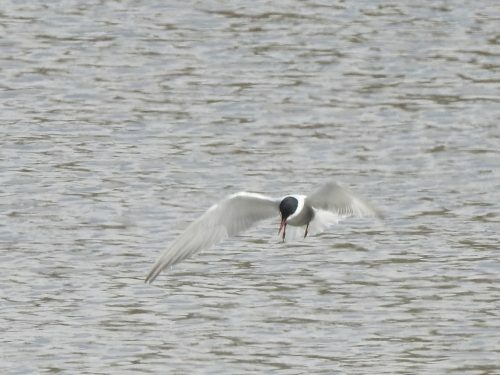 The shot above is the one occasion that the solitary bird came to rest on the small beach along the edge of the lake. 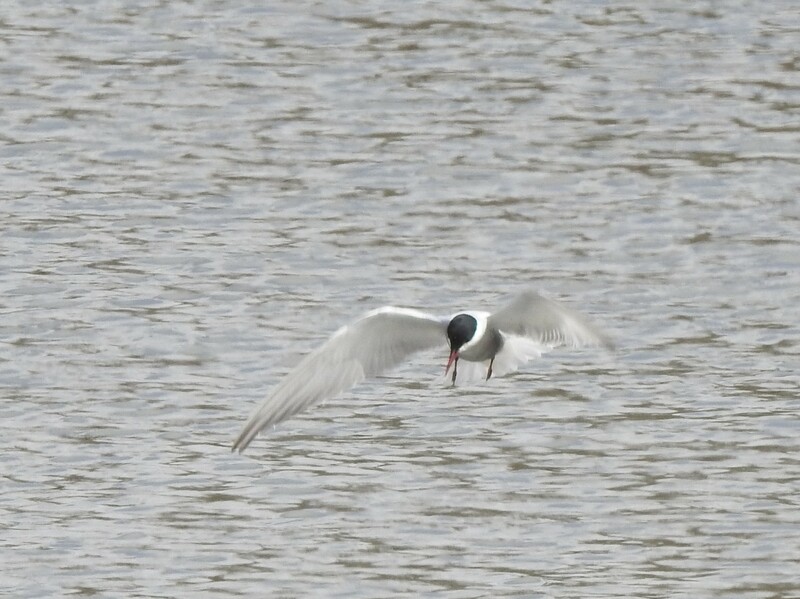 For the rest of the time, it kept flying around the perimeter of the small lake, diving into the water every ten seconds or so. I am not sure what it caught to eat, but it was quite persistent in this behaviour for most of the time I watched it. One of the better photos of it flying is shown below. I didn’t have much time to photograph all of the other species present on this visit. I have shown some of them below. One species not listed above is the Muscovy Duck. 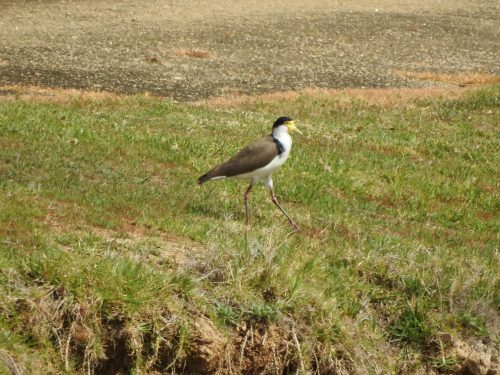 This is a feral bird found in a few places around Australia, usually near farmhouses, dams and artificial lakes and ponds. It is native to Mexico, Central and South America. Feral populations exist in many countries, mainly as a result of releases by people or escapes from farms and gardens. 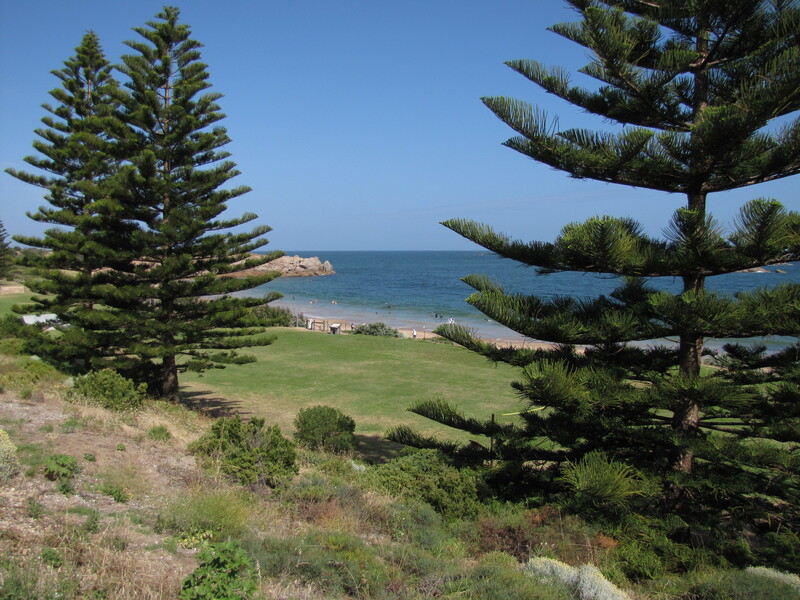 Last week I wrote about my visit to Horseshoe Bay at Pt Elliot here in South Australia. This day trip from home here in Murray Bridge was to celebrate our anniversary in a relaxed and enjoyable way. When we arrived at the picturesque seaside town of Pt Elliot on the south coast, parking at Horseshoe Bay was all taken up. This is not surprising because it was the middle of the school holidays as well as being at the height of the summer holidays here in Australia. The beach was being well used and it was crowded like I had never seen it before. 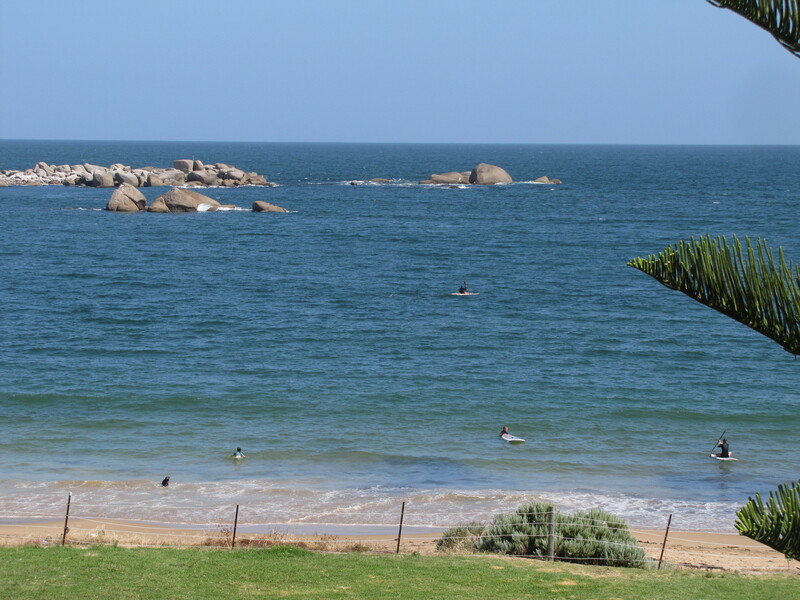 The weather was perfect for swimming and lounging around on the sand, so it was not surprising that it was crowded. 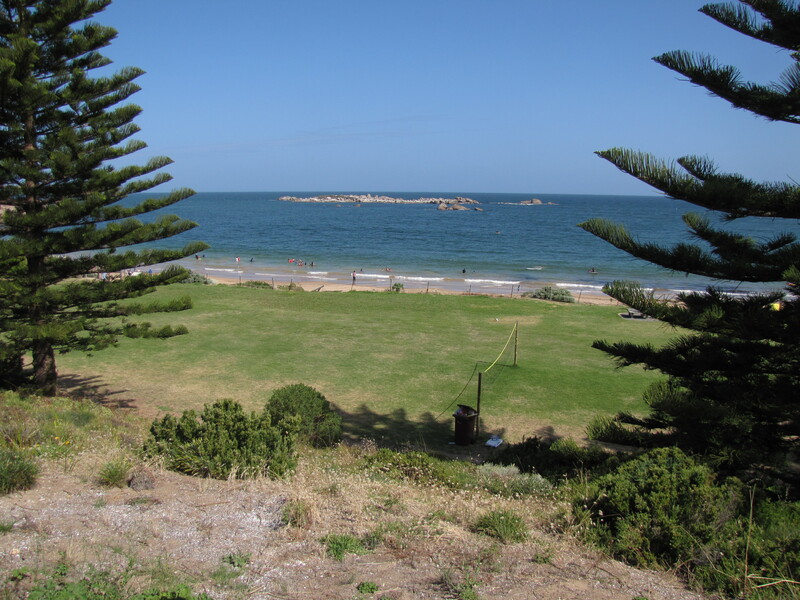 The nearby caravan park was also quite full, adding to the crowd on the beach. When I couldn’t get a park near the beach I decided to try another spot nearby. 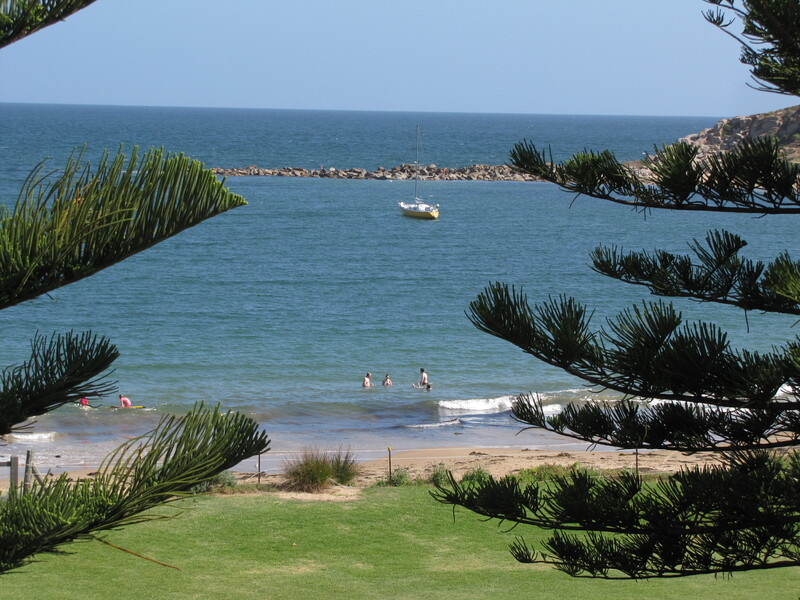 We are spoilt here in South Australia because we like to park close to the beach and usually that is not a problem. 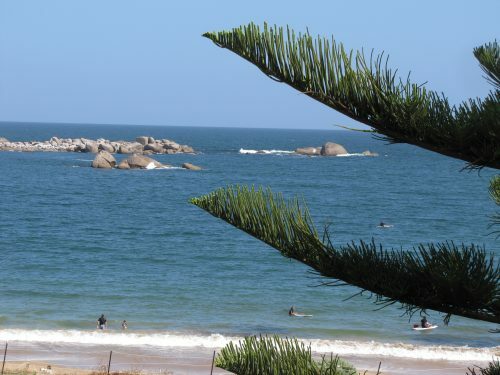 We have many wonderful beaches and ample parking is available at most of them. And, unlike some I have been to in Sydney, for example, there are no parking meters to contend with. Despite this, there was not a single park – except high up on the overlooking cliff well away from the beach where we wanted to have our afternoon tea. So, I drove the short distance to the local obelisk overlooking the bay. The car park there was almost empty, so I parked where we had a great view of the water, the bay and the nearby rocky islands in the bay. We sat in the car enjoying the vista in front of us, and the cool breeze made life very enjoyable. We enjoyed our cup of tea and home-made biscuits while soaking in the view – see today’s photos to understand what we enjoyed. 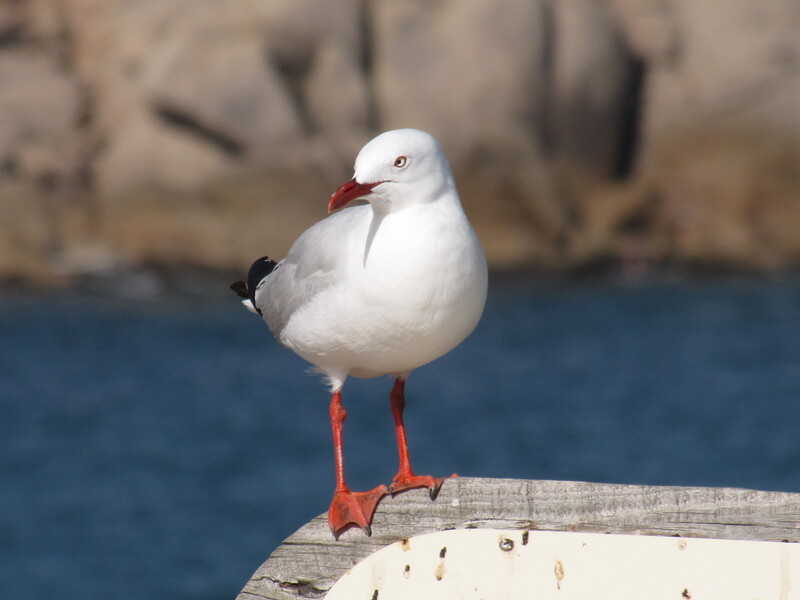 I didn’t get a chance to take many bird photos, except for the lovely shots of a Silver Gull I featured on another post here. Last week I wrote about a trip I took with my wife to celebrate our anniversary. 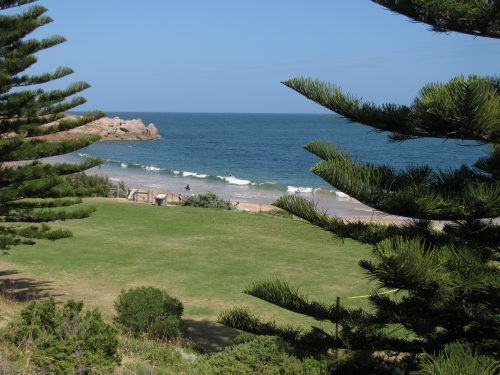 We travelled from Murray Bridge to Victor Harbor which is just over an hour’s drive south-west from home. 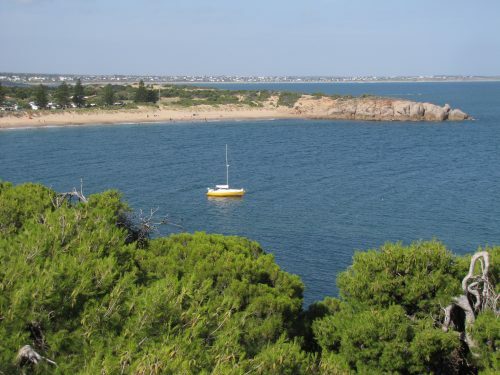 Along the way, we stopped at Milang, then at Goolwa, followed by an exploration of Hindmarsh Island, on to Pt Elliot and ended up having dinner at a favourite restaurant in Victor Harbor. While the day-trip was meant as a day out for relaxation, I had plenty of opportunities to do some casual birding wherever we stopped. 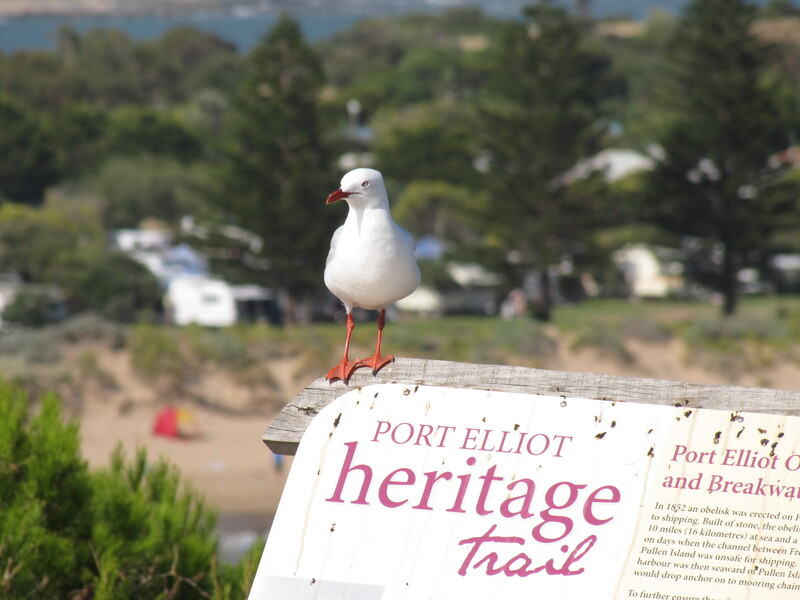 Pt Elliot is a lovely town of around 2000 population which swells in number during our long, hot summers. 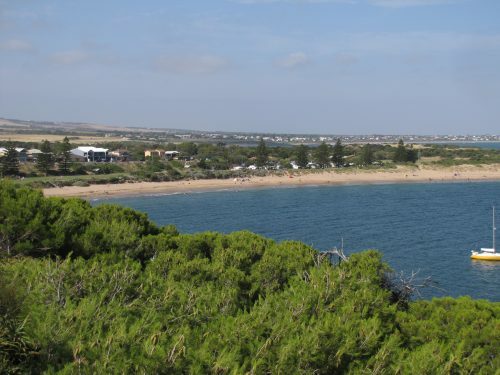 It is located on the south coast of the Fleurieu Peninsula and was established as a port in 1851. 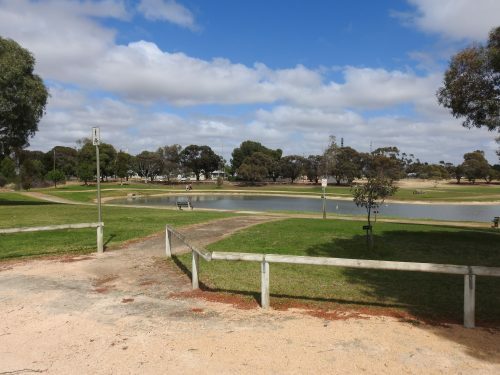 It boasts the reputation of having Australia’s first public railway line which extended from Goolwa. This railway line provided a means to carry cargo to and from the riverboat trade on the Murray River to seagoing ships. The mouth of the Murray River was considered too treacherous to navigate. The railway line is still in operation, though now it only carries tourists. 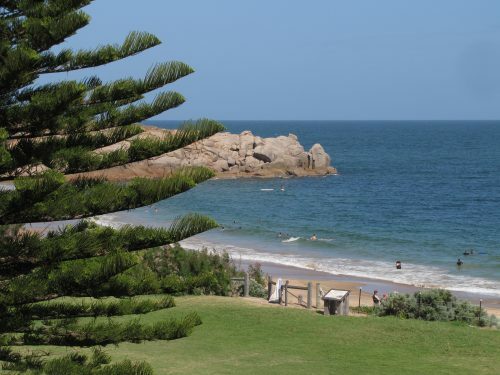 Pt Elliot has a delightful, and quite safe, little beach known as Horseshoe Bay. On our visit, it was very crowded despite the cool breeze. The local lawn bowls club is right next to the beach, and adjacent to the Flying Fish restaurant, known widely for its excellent seafood menu. The local caravan park just around the bay a little is very popular in the summer months. 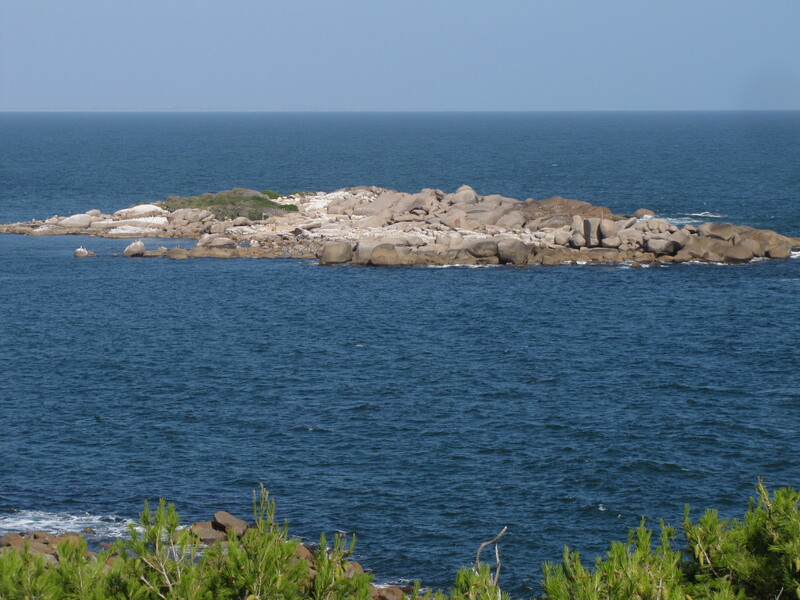 The birdlife here is a mixture of land birds and coastal birds. Of the coastal birds, I was not able to identify many on this visit. On Pullen Island out in the bay, I could see hundreds of Silver Gulls and several Pacific Gulls. A small group of Little Pied Cormorants rested on the rocks while the occasional Whiskered Tern, Crested Tern or Caspian Tern flew overhead. On the islands, I am sure that there were a few terns as well, though my binoculars were not strong enough for me to be certain. Away from the water, the Singing Honeyeater is a common bird of the coastal dunes and nearby bushes. Crested Pigeons can be seen throughout the town, often perched on rooftops or television antennae. Small flocks of Galahs and Little Corellas flew overhead. More frequently encountered are the Rainbow Lorikeets, either screeching as they fly low overhead, or noisily feeding on any flowering tree of bush in the gardens nearby. 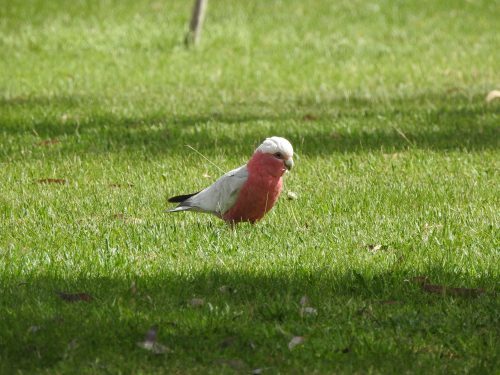 The lawns were attractive to the Australian Magpies, their keen eyes on the lookout for beetles, worms and other tasty morsels. Readers can go to further articles about some of the birds and places mentioned in the text by clicking on the links in blue. Earlier this week my wife and I celebrated another anniversary. My – how the years have flown by. We always try to do something special for our anniversary and agreed that the weather was suitable for a long drive and a picnic, finished by dinner at a favourite restaurant. 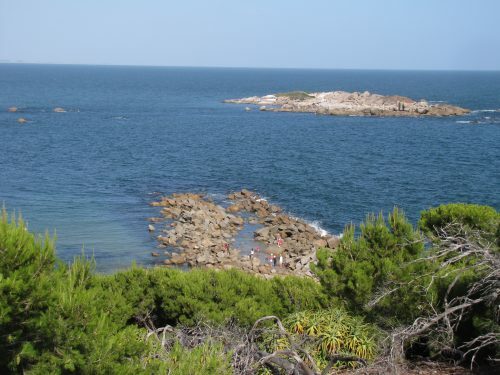 After an early morning chat on the phone with our grandchildren, we set off towards Milang, which is about 50 kilometres from our home. We stopped at the local bakery to buy our lunch, a Cornish pasty each, and a large lamington to share. We took our lunch down to the shore of Lake Alexandrina and had a picnic lunch on the lawns there. The largest river system in Australia, The Murray-Darling Basin, flows into this large lake, which in turn empties into the Southern Ocean near Goolwa. While we ate our lunch we watched some children playing with their dogs and on the playground. I took note of the birds I could see or hear, but things were rather quiet on that front – until someone disturbed a large flock of very noisy Little Corellas nearby. I have often thought that I would like to stay in the local caravan park right next to the lake, but I concluded that you would not need an alarm clock; the parrots would see that you woke at dawn, or even at first light. From Milang we drove on towards Goolwa and explored Hindmarsh Island – but I will write about that part another day. Later in the afternoon, we stopped at Horseshoe Bay, Pt Elliot. This small town on the south coast of the Fleurieu Peninsula is a popular holiday destination, being just over an hour’s drive from Adelaide. We stopped for a cuppa and some homemade biscuits in the car park at the lookout. I parked so that we had a great view over the bay. In South Australian history, this spot is quite important. Encounter Bay, which stretches for some distance to the south-east, was where English explorer Captain Matthew Flinders and the French explorer Nicolas Baudin met in April 1802. 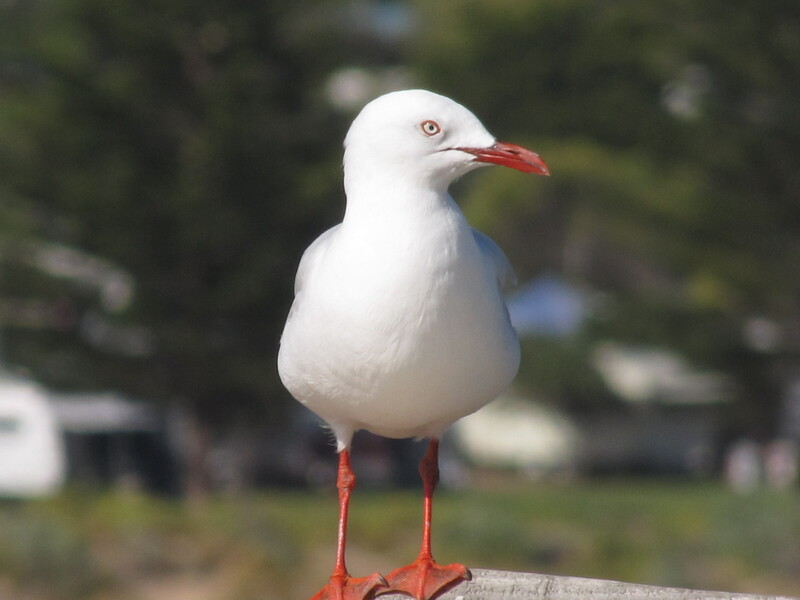 While we were having our cuppa, a solitary Silver Gull settled on an interpretive sign just in front of our car. It obligingly posed for a series of photos which I am sharing here today. 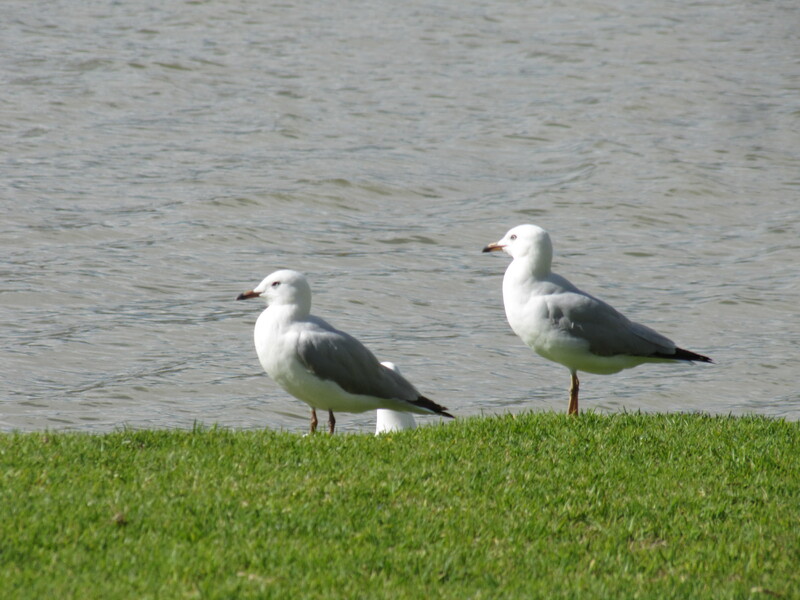 Silver Gulls are the most common gull found all around the coastline of Australia. 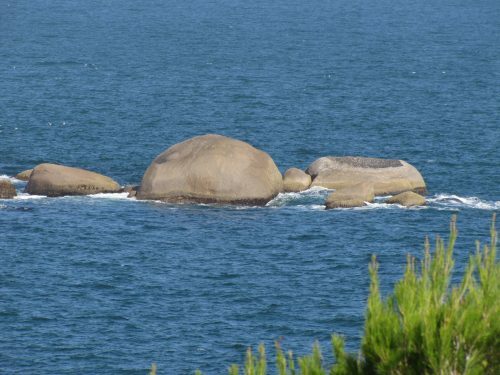 It can also be seen far inland where suitable bodies of water exist, such as river systems, lakes, reservoirs and swamps. 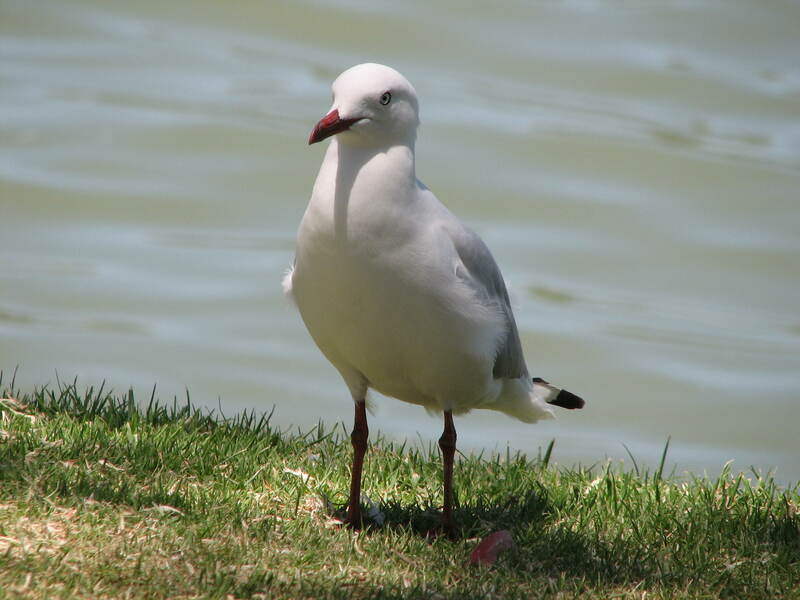 It can be very common in large numbers at rubbish tips, ovals, picnic grounds and beaches. This afternoon while watching the cricket on television my wife called to me from the garden. A flock of about 20 birds were circling in the air above our five acre property here in Murray Bridge, South Australia. I quickly grabbed my binoculars and headed outside. For the next ten minutes or so the loose flock of Silver Gulls soared on the breeze over head, circling around many times. They kept this up mostly silently with just an occasional soft contact call – nothing like their normal raucous, far reaching cry which is a quite familiar call. The whole time they stayed overhead near the shed, circling constantly over about a fifty metre radius. I am quite puzzled as to what they were up to. Perhaps they were feeding on flying insects but I couldn’t see exactly what they were doing, despite being able to observe individuals as they flew. Strange. Silver Gulls are widespread throughout Australia and are very common along the entire coastline, along river courses, around lakes, dams, reservoirs, swamps and any suitable habitat and are usually associated with water, but not always. 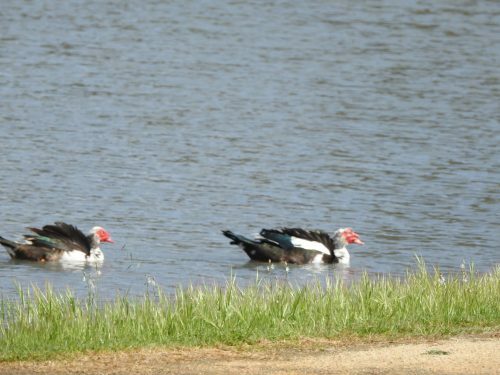 We are about five kilometres from the River Murray but we have some fly over our property every month of so, sometimes in large flocks of 50 to 100, usually quite high in the sky. This is the first time I can recall them coming so close to the ground; the flock stayed about 5-10 metres above the ground at all times. 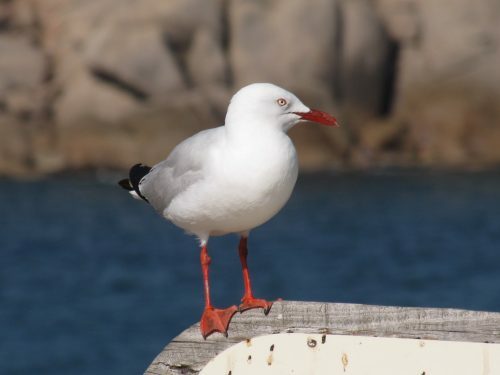 You are currently browsing the archives for the Gulls and Terns category.